Property 1: Vail Village - Top Rated Condo - Walk to Village Restaurants/Lifts - Epic Views! Property 3: Book next year ski trip now! Walk to Golden Peak Lifts, Ski School, Vail Village Shops & Restaurants, Convenient Location! Property 8: Walk to Golden Peak Lifts, Ski School, Vail Village Shops & Restaurants, Convenient Location! VAIL VILLAGE RENTALS: GREAT prices in The Heart Of Vail Village. Property 10: VAIL VILLAGE RENTALS: GREAT prices in The Heart Of Vail Village. Stunning Swiss Ski Chalet..Heart of Vail Village. Property 13: Stunning Swiss Ski Chalet..Heart of Vail Village. Creekfront condo in the heart of Vail w/ shared pool - steps from Gondola One! Property 18: Creekfront condo in the heart of Vail w/ shared pool - steps from Gondola One! Property 21: Great Location... Vail Village! Remodeled Village Condo Near Lifts ,Shopping and Dining. Property 33: Remodeled Village Condo Near Lifts ,Shopping and Dining. Stunning Condo with Peaceful Views of Gore Creek, Sleeps 4! Property 34: Stunning Condo with Peaceful Views of Gore Creek, Sleeps 4! No Car Needed! Heart of Vail, Walk to Lifts, Shops & Restaurants, Newly Renovated Studio w/ Loft! Property 39: No Car Needed! Heart of Vail, Walk to Lifts, Shops & Restaurants, Newly Renovated Studio w/ Loft! Located in the heart of Vail Village. Underground parking, hot tub & pool! Property 43: Located in the heart of Vail Village. Underground parking, hot tub & pool! We enjoyed staying in VTE 7A - it's a comfortable 2 bdr unit in a great location. We know Vail very well, usually staying closer to the Solaris, but we found this location to be preferable for us. 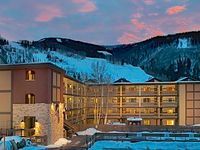 It's an easy, short (one stop), free bus ride up to Golden Peak and chair 6 (my preferred way to get to the slopes) or a short walk to Vail Village and Gondola 1). While still centrally located, it's also a quieter location than many. The unit is fine, adequate, comfortable. If you are looking for a place with the latest features and styling, choose a different place, but this place is priced right and is comfortable. My only small objection/suggestion is to replace the King mattress. It's comfortable enough, but there are dips on either side (advantage: you won't easily roll over to your partners side of the bed ;-). You don't need a car in this location, but if you have one, parking for one car is offered and is easy. Access/check-in/check-out was easy. I'd be happy to rent this unit again. My family and I just returned from our trip to Vail and our stay at your lovely condo at The Wren. Your condo is FABULOUS! I've been staying at the Wren for years with a buddy who has a time share, and while his place is comfortable and nicely appointed, yours is in a whole different league. The view from your balcony is breathtaking. The appointments in your condo--the tile, the bathrooms (especially the second one), the kitchen, including a well stocked pantry, and top line cookware, dishes, and knives that are actually sharp.